It’s that time of year again, when we transition from summer into fall. Cooler temperatures and variable weather conditions can cause problems with your summer exercise routine. Stay on track by planning for a smooth shift from warm walks in shorts and t-shirts, to walking or running in cooler air and precipitation-covered terrain. Soak up the sun! Get outside as often as you can. Sunshine has mood-boosting properties. It’s good for the spirit, and is essential, especially during the longer, darker days of winter. Being outside itself with the expansive room to roam also makes a difference in our mood. It serves as a stress release from so much time inside in smaller, artificially-lit spaces. Check the weather forecast before heading outdoors. Knowing how much time you have, and the weather you’ll encounter outside, is a key piece to the success of any time outdoors, especially in winter. Wear reflective clothing. One small strip of reflection on a jacket or shoe can make an important difference in your safety when others are able to see you. Invest in YakTracks or Microspikes to ensure a solid footing and safe trek through possible snow and ice under foot. Wear clothing with moisture-wicking properties to keep sweat from accumulating against the body. Dry clothing will keep you warm. Avoid wearing cotton as it tends to collect sweat and hold it in place. Take a hat with you to protect your ears, keep precipitation from wetting your clothing, and help contain heat in the body. Wear sunscreen and chapstick to help avoid getting dried, chapped and split lips from dry winter air. Get a headlamp to light the way along sidewalks and trails, illuminate pot holes, and allow cars and traffic to see you in challenging light. Stick to well-lit streets, and use daylight hours as much as possible. Stay hydrated. Drink water before you leave, while you’re outside, and when you return. The body does plenty of work keeping itself warm, so adding exercise to the mix makes it essential to hydrate. Warm up before you go. 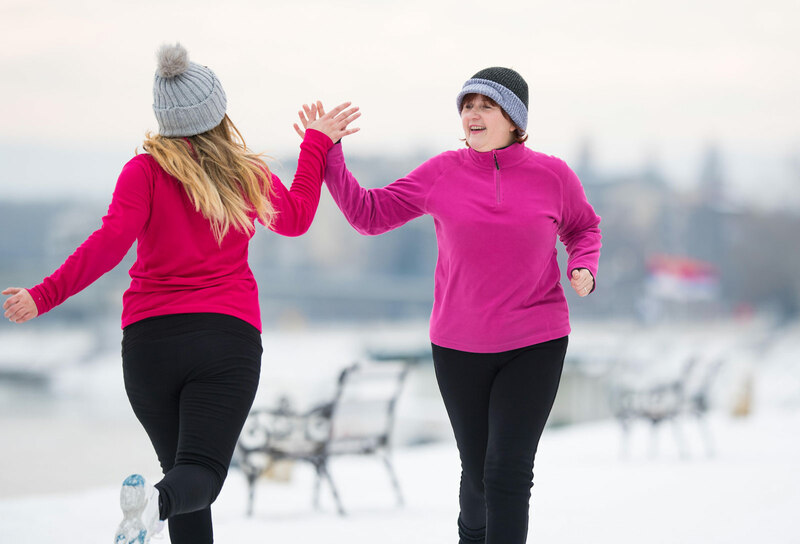 Do a few jumping jacks, squats, or lunges -- or climb a flight of stairs, something active, just before walking outside – enough to get the body warm and ready for that cold air outside. Stay healthy and be mindful of winter germs floating around. Wash your hands throughout the day, especially in public, and avoid touching your face where germs are transferred into the body.